High-Efficiency Toilets (HET) – How Low Can They Go? The State of California in 1992 (the Federal government followed in 1994) required that all toilets sold used no more than 1.6 Gallons Per Flush (GPF). These were called ultra low-flush toilets or ULFT. Many cities and counties offered rebates for replacing older toilets that used more water. 15 years later, in 2007, the State raised the bar by nearly 20% and required that all new construction install High-Efficiency Toilets (HET) that flush 1.28 GPF maximum. Again, many cities and counties offered rebates for replacing older toilets that used more water, although these are beginning to be phased out. A number of methods are used to achieve efficient water usage in toilets and some work better than others. Some manufacturers also offer a dual flush option. 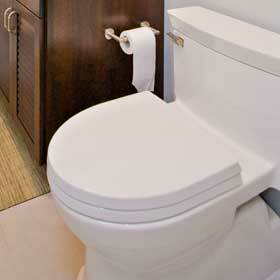 By 2014, all toilets sold in California must meet the new flush standards. The high efficiency toilet above comes from this Los Altos remodeling project.